PICTURED: Shadowy figure of female ‘vampire ghost’ terrorising schools in Malaysia - BlogIT with OLIVIA!!! 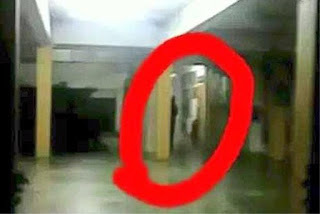 A PICTURE has emerged claiming to show one of the female vampire ghosts that have been terrorising schools in Malaysia. The spooky snap shows a shadowy figure peering out from behind a pillar in a corridor. It is claimed that the image shows one of the evil spirits that have been causing havoc in schools around the country. The ‘pontianak’ is a kind of vampiric female ghost from Malaysian and Indonesian folklore.The restless spirits of women who died on childbirth, they are said to have come back from beyond the grave to prey on men. Both students and teachers have reported seeing the spectres, with one teacher even claiming to have been physically pinned down after going to help a student who said she had seen a ghost.The sightings have been described as an ‘epidemic’ with one school shutting down and another group of 20 students having to be sent home in one go. The local education authority in Kota Baru has even called in shamans and religious leaders to clear out the ghosts, according to the Straits Times.